Boil the pasta for 3-4 minutes adding salt. Drain well, add some organic olive oil and toss lightly. Cut the cherry tomatoes in 4 pieces and the cucumbers in small pieces. 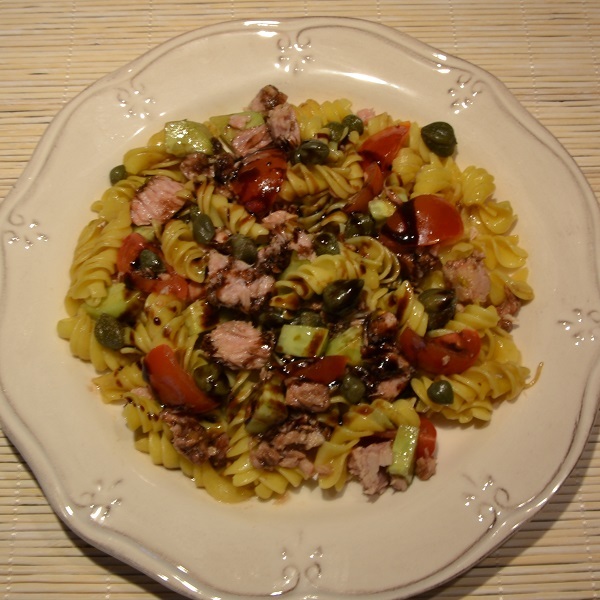 In a large bowl, put the pasta, add the tuna fish, cherry tomatoes and cucumbers. Sprinkle with olive oil, salt and balsamic sauce with carob honey and mix lightly. Serve adding some caper knots and decorate the dish with some extra carob honey balsamic sauce. This dish can also be enjoyed as a warm or cold pasta salad.